The Lake Forest Cottage has been beautifully restored preserving the original granite fireplace and all the detailed woodwork of the 1920’s. 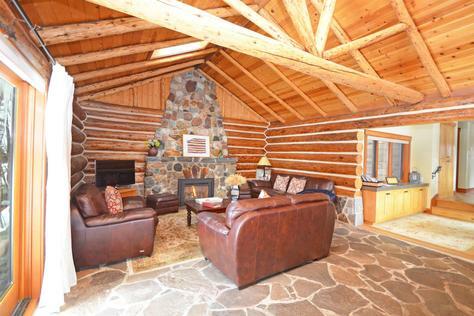 The living room is large and open yet cozy with the gas log fireplace and lots of windows. The kitchen is open to the great room and has been modernized with granite countertops and the latest high-end appliances (Sub-Zero refrigerator and Wolf range) – very inviting for the guest who likes to cook. The spacious bedroom with king-sized bed is quiet and peaceful and great for sleeping! This charming and private cottage is a wonderful place for two people who want to get away from it all! There is a peek of Lake Tahoe from the living room. Lake Forest Beach is a few hundred yards away and Skylandia Park and Beach, a short walk away. The paved bike path that takes you into Tahoe City and continues along the West Shore or down the Truckee River is just a short five-minute bike ride away. The ski resorts Alpine Meadows, Squaw Valley and Northstar are each about 20 minutes driving distance. Tahoe Cross Country Ski area is a very short three minute drive for winter Nordic skiing or snowshoeing. In the summer Tahoe XC offers an expansive mountain biking trail system. This location is central to Tahoe City and Kings Beach for shopping and a variety of restaurants. 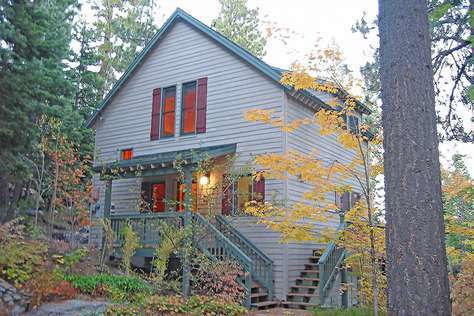 The cottage is part of an original Lake Tahoe Estate. You have access to Lake Tahoe along a public path. The main house on the estate is rented full time and we ask that you respect the resident’s privacy. There are two dogs that live at the main residence and who, along with the human residents of the main house, may be seen around the property during your stay. 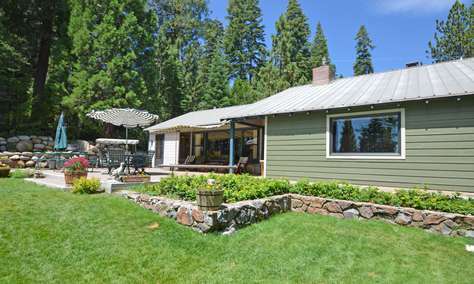 This North Tahoe family cabin has been extensively remodeled in keeping with the original mountain bungalow charm. 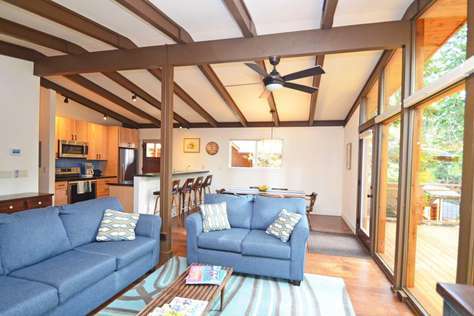 Refinished wood beams, entirely new contemporary kitchen and with the original floor to ceiling windows give the cabin an open yet cozy Mountain feel. The great room has a gas log fireplace creating a warm and inviting space on those snowy winter or chilly summer Tahoe evenings. The fully equipped modern kitchen opens to the dining and living area - perfect for a family or friends social gathering. All the bedrooms are warm and welcoming with cozy down comforters. 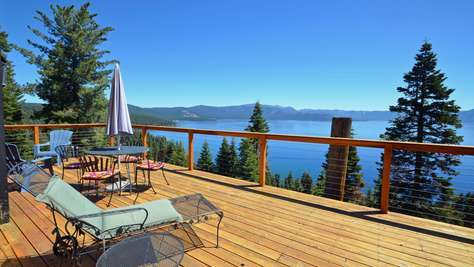 A new very large deck with a BBQ and outdoor furniture offers a peaceful place to hang out and relax after a day of Tahoe fun. A short, easy, less than 5 minute walk takes you to Lake Tahoe for some beach time. 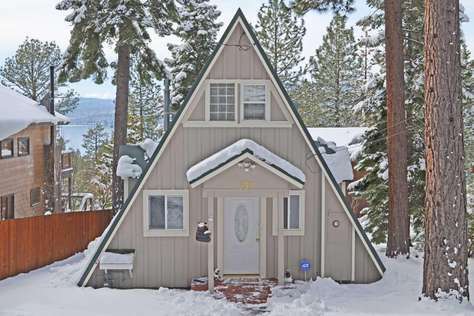 Kindred Tahoe Cabin is located in between Tahoe City and Carnelian Bay in the community called Cedar Flat thus making it central to the ski resorts of North Lake Tahoe; Squaw Valley, Alpine Meadows, Northstar and Mount Rose. North Lake Tahoe also boasts numerous public beaches, hiking and mountain biking trails, golf courses, Truckee River rafting, local community events, shopping and dining. 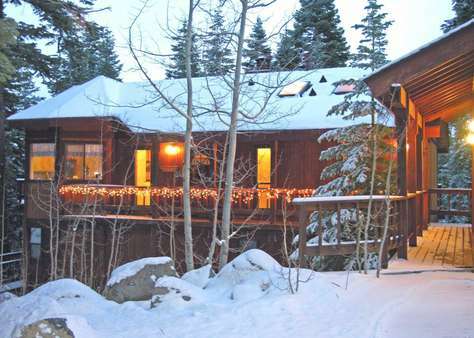 If you are looking for a quiet inviting home - Kindred Cabin is the perfect choice! Let Tahoe Bear Haus be your base camp for all your North Tahoe fun! The welcoming Tahoe Bear Haus is a classic "A" frame with floor to ceiling windows flooding the cabin with light and showcasing the views of Lake Tahoe and the surrounding mountains. The sunny south west facing deck is a perfect place to hang out and watch a Tahoe sunset or just lounge and relax with a book. In the summer months - there is a propane BBQ and outside furniture on the deck. The entire interior of this mountain cabin is covered in the original pine paneling bringing an inviting and cozy feel to the cabin. The living area is open to the dining area and kitchen - making the area enjoyable for the entire group to socialize together. 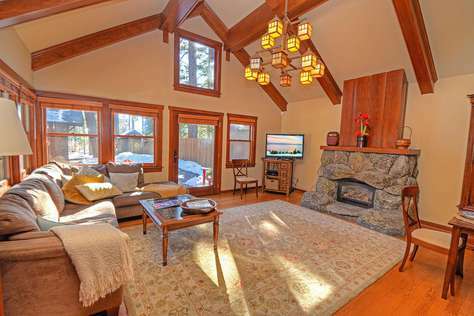 For the chilly Lake Tahoe mountain nights there is a gas log fire place creating a pleasant and welcoming atmosphere. For the chef in the group, the kitchen is newly updated and fully out fitted to cook any celebration or holiday meal. The 2 bedrooms and the loft bedroom, which is open to the living area, have a homey mountain cabin feel with comfy beds and thick comforters. Both bathrooms have been completely remodeled and the master bath boasts a very large walk in shower. Just a short walk up the road from the cabin there are trails for hiking and mountain biking. 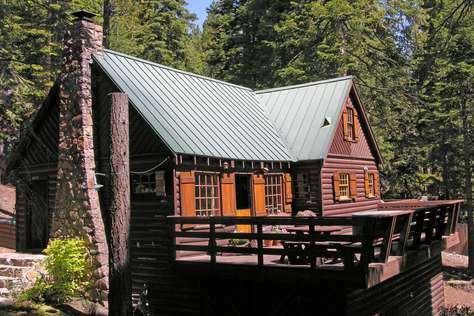 The cabin is located in Kings Beach about - mile to the lake - making access quick and easy. The North lake Tahoe area offers numerous public beaches, trails for hiking and mountain biking and many different summer and winter events. Kings Beach is a small community with shopping, dining and music on the beach every Friday summer night. For the gamblers in the group, the North Lake Tahoe Casinos are about 5 minutes away. Northstar Ski Area is about 15 minutes away, Squaw Valley, Alpine Meadows and Mount Rose are all about - hour dive away for winter skiing and ice skating. For Cross Country skiing and snow shoeing our local Tahoe XC center is about a 15 minute drive. 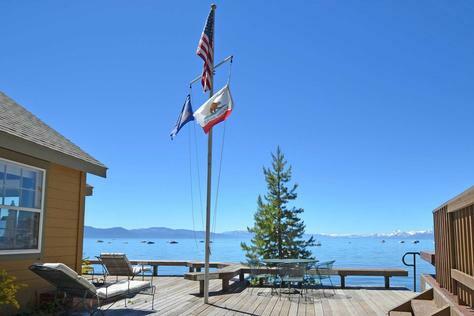 Sit back, relax and enjoy the beautiful view of Lake Tahoe from the open great room or sunny deck of this lovely lakefront condo. You can walk right off the deck, across a lawn, and into the Lake. There is a pier and you can reserve your own personal buoy upon availability. The comfortable living room is open to the dining area and the fully equipped kitchen making it accommodating for the social cook. The master bed room has a private balcony with a view of the lake. 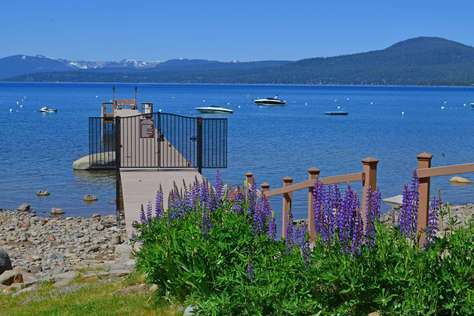 Located in Brockway on the North Shore of Lake Tahoe for lots of summer fun - swimming, boating, kayaking, fishing, picnicking and relaxing. For winter fun Northstar Ski Area is 15 minutes by car and Squaw Valley and Alpine Meadows are 25 minutes by car. The North Shore also boasts wonderful lakefront dining and a variety of nightlife including the casinos which are just a few minutes drive away. 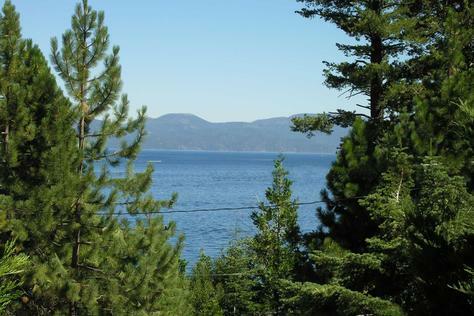 This fantastic Tahoe lakefront condo has a great central location to the North Shore of Lake Tahoe! What a great vacation home that you will want to return to time and time again! 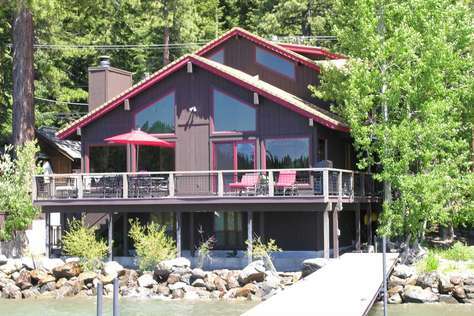 The breath taking views of this North Tahoe lakefront home will both inspire and comfort you. Enjoy a good book on one of the two decks, crawdad fishing off the pier, a refreshing morning swim, early morning water ski, sunset paddle board adventure - this list goes on and on. There is a game room with a pool table, ping pong table and a hockey shuffle board for some friendly family competition. On chilly evenings cozy up to a fire in the great room's granite fire place while enjoying the view of the alpenglow on the mountains of Lake Tahoe. 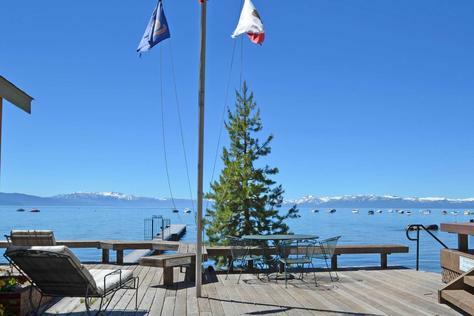 Winters at this house is a treat - the view Lake Tahoe with the surrounding snow capped mountains will sooth your sore muscles from a long day playing in the snow. The kitchen and 3 of the 4 bathrooms are newly remodeled making this home even more inviting! 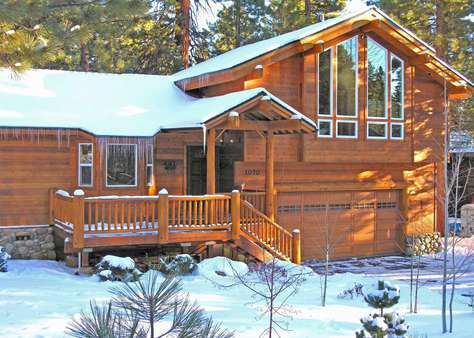 Centrally located on the North Shore of Lake Tahoe just a few minutes away from all the summer and winter activities - hiking, golf, tennis, and skiing. North Lake Tahoe boasts a number of renowned restaurants and a variety of shops. There are even a few casinos to offer the gamblers in the group. A genuinely relaxing and fun filled home!